The SE-C450 is combining style with functionality. 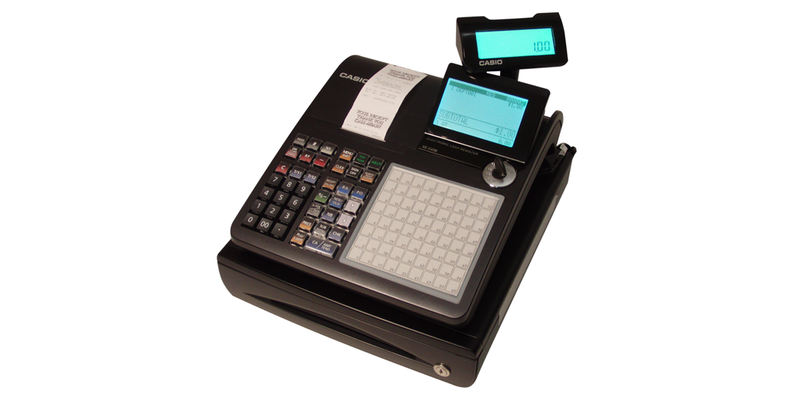 The SE-C450 10-line LCD provides the operator a reference for the current transaction to eliminate errors. Up to five (5) items, the transaction subtotal and the price of last item entered are all displayed for the operator’s review. The SE-C450 also boasts a 2X2 pop-up customer confirmation display with the last item’s name, price and the transaction subtotal. The SE-C450’s large flat keyboard (72 key positions) make this machine a perfect fit for small quick service, concession and take-out operations. The flat keyboard will accommodate those items deemed fast movers or frequently sold items allowing operators to speed up transaction time. The SE-C450’s single (1) station thermal printer can be used as either a customer receipt printer or as a journal printer. An optional electronic payment device can be connected to the machine allowing the store owner to integrate credit, debit and gift card transactions. The integrated payment device will decrease the time it takes to finalize a transaction and the close out process at the end of the day.